For scholarly publishers, librarians, and readers, the article remains the coin of the realm — a text-based narrative that strips data of all but its most superficial aspects and doesn’t integrate itself into the body of knowledge it supposedly adds to. Your eyes can read the words and see the figures, but you can’t explore the article, expand the data, or experience how this new work fits into the realm of knowledge. A main reason for this may be that computer interfaces have been, themselves, enslaved to the word, with keyboards, printers, viewscreens, and mice allowing us to do basically what we could do before — write information, read information, put information on paper, and move containers of information about. New advances may change this, and some publishers are grasping the opportunities. An enhancement to touchscreen technology, which provides the user with the ability to apply multiple finger gestures simultaneously onto the electronic visual display to send complex commands to the device. The variety of app-delivered games and tools currently available offers a representative taste of current capabilities in graphics manipulation and uses for interactively received inputs. 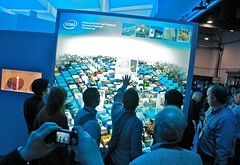 The true potential for multitouch technology is still in its nascent stage. Displax and Archimedes Solutions are two companies seeking to seize the opportunities offered in this emerging area. Displax is promoting a lightweight, transportable polymer film that will transform a 50”+ LCD screen into a receiver that can accept input from 16 simultaneous touch points and registers the intensity and direction of air flow (the latter conjuring up visions of puff-driven Frisbee golf or other spin-offs of lung-powered Pong). Displax projects are predominantly B2C focused, including museum exhibits, TV meteorological reports, World Cup analysis, and retail and virtual shopping displays. Archimedes Solutions has its roots in the high-tech exhibits business. But, while Displax is focused on lightweight solutions, Archimedes has headed in another direction with Session Desk, a heavy-duty hardware installation that resembles a 1970s copier. Don’t let this dissuade you from watching the Session Desk trailer on YouTube. If video manipulation and/or data visualization are of interest, you’ll find something of interest in this four-minute product demonstration. Information experts should begin to grasp not only how multitouch technology supports limited information interactions, such as those delivered by iPhone app, but what course this sets for future content and data experiences. The new [STMicroelectronics] multi-touch controller detects up to ten simultaneous touches with fingers, nails or stylus, enabling application designers to replace complex menu sequences with more direct and natural user controls. Actions made easier with multi-touch capabilities include browsing and selecting options, handwriting and data entry, arranging and sizing windows, picking up and dragging images, and fast and intuitive game play. Other abilities include drawing pictures, using touch pressure to adjust line thickness. As these technologies continue to improve, they will significantly alter the ways we work with and experience information, including images and data. We will increasingly transition from environments governed by the restrictions of mice and keyboards to more fluid and interactive environments — in the vein of Wii, iPad, and iPhone — that support a more fluid, intuitive, and experiential exploration of scientific and non-scientific content and media. While timelines are uncertain, expect that consumers of our information will include traditionalists/linear thinkers and visual/experiential thinkers, all of whom will increasingly require that we meet them “where they are” by providing a suite of mechanisms for interacting with content of various types. This requires us to have a vision and strategy for managing transition and an understanding that most of our transitions are complicated by an attachment to prior modes of working. How long will be able to maintain a foot in every camp, supporting numerous devices and capabilities? What strategies will we develop (as an industry) to manage efficient and economical change? 16 Thoughts on "A Future of Touch and Gestures: New Interfaces Driving Scientific Information Presentation"
We should therefore not view text as a superfluous anachronism to a print-based past — something that remains in articles today because of historical inertia. Text is necessary in articles because it creates a narrative to understand the data presented. Data cannot do this alone. Certainly there is room in some data-intensive fields for new visualization tools. But we shouldn’t discredit conventions just because they are old. Yay for Phil – your response was spot on. Data are just data – without some kind of interpretation, they mean nothing. While I’m a big proponent of multitouch tech (writing this response from an iPad), I don’t think that text-based articles are going to vanish anytime soon. They’ll just get more interactive. Too true Phil, we are, at heart, story telling creatures. There’s also an efficiency to text that’s perhaps even more vital in today’s “information overload” world. I don’t want to spend 10 minutes fiddling with your interactive data visualization to get the take-home lesson from your experiments. I don’t want to sit through a 20 minute video either. Sum it up in an abstract which I can read in 30 seconds and then either move on or dig deeper. Very good points. Text and narrative shouldn’t be dismissed, but new ways of representing data can also be embraced. Some data and ideas become much clearer when represented visually, and new findings can be revealed if the displays are interactive. Information interpretation isn’t just about what the editor or presenter provides — each reader or user brings something to it, as well. There’s potential in interactive displays to allow users to see things — validly and robustly — in ways tailored to their needs and reflecting their interests. One complaint that continues to resonate with me from scientists is the complaint that they have machine-readable, digital data, can provide it to publishers, and consider it the richest version of their reports, yet publishers, because they’re fixated on print, strip out the digital aspects and draw a scattergram or a line chart. That’s superficial. Integration is another dimension that text doesn’t do well — jargon, colloquialisms, and other linguistic artifacts can make integration impossible or unreliable. Moving standardized data allows better integration than text does. We shouldn’t discredit conventions because they are old, but we should also update those conventions so that they work in the modern world. Though that forward-looking integration of technology should be tempered by the real-world usage statistics from most journals which show that readers mostly just use the limited and relatively ancient pdf format (usually printing that out on paper for reading) and a near universal ignoring of supplemental data and movies when they’re made available. If you build it, they still may not come. Videos, done right, are not ignored. In fact, in medicine, videos are extremely popular when done well and right. The trick is to do it right. And I can’t believe you used that quote! Haven’t we talked about this?! Well, I did use the quote in a negative manner, refuting it as a reason for investment. And yes, new technologies that really add value will catch on–but there’s no guarantee of a return on the investment of building them. You’ll note I didn’t say they should be avoided, I said that investment should be tempered. Publishers seem to have a habit of getting caught up in technologies just because they’re new and cool. New and cool does not necessarily also mean wanted or likely to be used. You have to be smart, selective and deeply in touch with your readers’ needs. As for videos, the statistic I want to see is length of viewership. I’m willing to bet that the vast majority of viewers don’t make it past the first minute of any given video. That’s why I believe in short demonstrative videos rather than lengthy narrative ones. I was teasing about the quote, I hope you know. It’s still a pretty irresistible quote. I completely agree that you have to be smart, selective, and deeply in touch with your readers’ needs. But shouldn’t you always be? At NEJM and here at JBJS, the metrics I’ve seen around videos reveal long average view times, even in chaptered videos. We’re talking 80-90% of a 6-minute video, 60-70% of a 25-minute video. And we can’t measure the view times for downloaded videos (so these are just streaming times), but downloads are extremely popular, outstripping streaming views in a lot of cases. If you’re smart, selective, and deeply in touch with users’ needs, video (and interactives) can work really well. The “ifs” are the toughest part. Medicine is kind of a world unto itself, not sure how well the behaviors reflect on different communities as the career activities and pressures can be so different between an MD at a group practice and a postdoc in a university lab. So usage may vary with the needs of the community served, again an argument for being selective and in touch with your specific readers. And while we both agree that this is important, it’s clearly not practiced all that often, given the millions sunk into networks, knowledge environments and all sorts of other technological enhancements that mostly leave one scratching one’s head. I completely agree. Medicine has a history of working well in video, both in popular media (“House, MD” comes to mind) and in professional media. It would be dumb, random, and inattentive of audience to roll out media they don’t care about, so I think returning to your exhortation to be smart, selective, and deeply in touch with your audience probably provides timeless (and media-neutral) advice. After all, whether text, video, interactives, or something else, if the audience isn’t interested, it’s a waste of time. I think that this issue is purely that of convenience. I like to download the PDF so that I can read it at my convenience – usually at a distinct time from when I went to the journal’s site. Many people will print them out, and now that I have an iPad, I just read them on that. It’s not that people don’t want to see the videos or interact with the data. But if it requires an extra trip to the publisher’s website, it often won’t happen. This hints that the future will be in readily distributable PDF-like documents that have containers for video, interactive data widgets, etc. It’s an interesting question. It kind of gets back to the iTunes versus Rhapsody/Spotify models for usage. Do you want a version that you own and control and can use at your own convenience however you wish to use it (an iTunes purchase), or is access to an online version sufficient (Spotify streaming)? Most journals do a terrible job of making supplemental data readily available, the reader has to jump through ridiculous hoops to get it. Also, the printed out pdf is a lot easier to scribble notes on, something not so simple on an html version. You folks are talking as though writing itself were somehow made obsolete by digital technology. That is hardly the case. Science is about explaining things and it takes words to do that. This is not to say that visual data and motion videos are not important, just that writing is central (and easy to produce). Our civilization is based on writing and that is not about to change. http://www.osti.gov/ostiblog/home/entry/sharing_results_is_the_engine. This map consists entirely of text. A written article is just a list of sentences, presented line by line it its most compact form. But there are important structural relations among those sentences, such as the issue tree and various important networks. Seeing these structures will greatly facilitate understanding. As it is we have to grasp them intuitively and we often get them wrong. So perhaps it is not that writing can be replaced by visualization. But rather that the 6000 year old “long line of words and sentences” format for writing can be replaced by visualizing text in non-linear arrays which reveal the intrinsic structures in the ideas being presented. And likewise for the many papers that bear on a given topic. Seeing the “Web of Belief” as it were, especially in science. “consumers of our information will include traditionalists/linear thinkers and visual/experiential thinkers, all of whom will increasingly require that we meet them where they are by providing a suite of mechanisms for interacting with content of various types”. The point, I think, is to offer more mechanisms for understanding and engagement with knowledge, which foster and ‘speak to’ different learning styles. This does not have to be text-less but can be text-plus or text-alternate. David’s tree mapping example strikes me as having resonance for text-ies, while also surfacing structural and conceptual relationships—added value ways of conceiving of the information that will promote further thinking and creation. Kent’s piece yesterday (Traditional Measures of Quality: Irrelevant, Miscast, Outdated, and Inhibiting?) addresses cultural divides. I believe that the debate around text is one of these—-and that we do best when taking a bridging approach, rather than seeking to exchange one for the other. This does, however, create additional business challenges for publishers who must support simultaneous formats or—-more efficiently—-will need to come up with newly integrated solutions. Indeed Alix, this is more a matter of building out and bundling than either-or. However, I do not think it is a matter of learning styles so much as it is of the intrinsic nature of the information itself. Among the textual maps my favorite was mapping the transition paths from basic research to the fleet. For example from ceramic materials research to ceramic turbine blades to new ship propulsion systems. Each path was clear but there were so many that the map was very complex. Diffusion of technology is like that. Unfortunately the Admiral thought it looked all too complicated, even though we explained that it was an accurate picture of his situation. So the project was terminated. Lesson learned: visualization can be scary. The problem with many integrated solutions is that they mash together several distinct structures. It is like having a highway map that does not distinguish roads from rivers (which are hard to drive on). The Semantic Web in particular suffers from this confusion of relations. Once upon a time humans invented mapping. We are there again.